- EUR slides after November inflation data disappoints market. - CPI falls to 2% while core inflation retreats back to 1% level. - Core CPI has now not risen in 2018, adding to ECB's headache. The Euro retreated from the week's high on Friday after official data revealed a steeper-than-expected fall in inflation during the month of November, adding further to an existing headache for the European Central Bank (ECB). Inflation rose at an annualised pace of 2% during the current month, down from 2.2% back in October and beneath the market consensus for a reading of 2.1%. Core inflation, which removes volatile commodity items from the goods basket and so is thought to provide a better reflection of domestically generated price pressures, fell from 1.1% to 1%. The disappointing core inflation number is most significant for the market not only because it provides a truer reflection of organic price pressures, but also because the rate has now returned to its January 2018 level. In other words, official data suggests domestic inflation pressures have not really picked up this year, undermining the ECB's outlook for prices. Above: Contributions to inflation by category. Source: Eurostat. "These data will add to the pressure on the ECB to send a more dovish signal next month. It will probably abandon the position that risks to the economy are “broadly balanced” and certainly also continue to note that underlying inflation remains low," says Claus Vistesen, chief Eurozone economist at Pantheon Macroeconomics. Eurozone inflation rose from 1.3% in January to 2.2% in October largely because of what was recently a near-20% 2018 increase in the price of oil. However, Brent crude has fallen more than 20% from above $80 in October to below $60 at one point in November, suggesting that much of this inflation pressure could unwind over coming months. Core inflation, the truer measure of domestic price growth, began 2018 at only 1% and now looks set to see in the New Year at exactly the same level. "The weak core inflation is in part due to concerns about a cooling economy, which have made businesses hesitant to price through higher input prices such as increased wages. Softer headline inflation for the beginning of 2019 is largely expected, but the degree to which inflation will drop will be key for the ECB to determine when to hike," says Bert Colijn, an economist at ING Group. The Euro-to-Dollar rate was quoted -0.08% lower at 1.1383 Friday but is down 5% for 2018, while the Euro-to-Pound rate was -0.16% lower at 0.8895 and has risen 0.54% this year. "Euro-area core inflation is still weak. 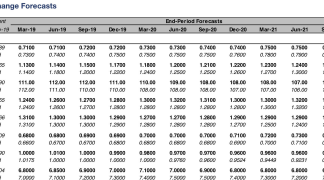 The negative surprise is not going to change the ECB’s plan to end the net asset purchases at the end of the year but the risks of a further delay in rate hikes are increasing," says Tuuli Koivu, an analyst at Nordea Markets. Currency markets care about the inflation data because consumer price pressures have a direct bearing on the interest rate and other monetary policy decisions of the ECB. 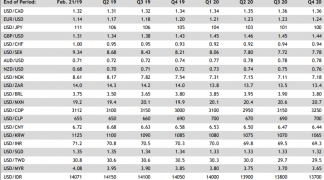 The Euro's appeal to investors is currently hinged upon the ECB ending its quantitative easing programme in December and beginning to lift its interest rates from record lows in the final quarter of 2019. "Although the ECB will end its bond purchase program at the end of the year, weaker economic growth in the euro zone and continued low inflation rates suggest that the ECB will not raise key interest rates until 2020," says Ulrich Leuchtmann, head of FX strategy at Commerzbank. A deteriorating inflation outlook and its implications for the Euro are intertwined with other headwinds like slowing growth on the continent. German GDP growth fell to -0.2% in the third-quarter and Eurozone growth halved to 0.2%. The growth outlook has been dented of late by many factors including new regulations in the automotive sector and the effect President Donald Trump's "trade war" could have on export-dependent countries like Germany. This has undermined market confidence in the ECB's forecast that inflation will soon be able to sustainably meet the bank's target of "close to but below 2%" because a pickup in organic price pressures requires "above potential" growth. The European Commission estimates potential growth to be around 1.5% and the ECB forecasts GDP will grow above the potential rate over coming years, but momentum is falling and even in the bloc's best post-crisis days back in 2017, inflation pressures were not strong enough to support a return to target. "As the monetary policy normalization process will thus begin later than expected, the euro will also only start to appreciate against the dollar later than we had so far assumed. 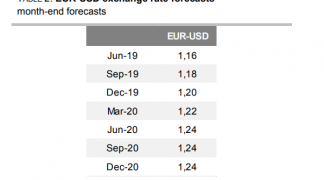 All in all, we forecast a slow upward trend in EUR-USD in 2019, which will accelerate in 2020 due to the expectation of rising interest rates," says Commerzbank's Leuchtmann. 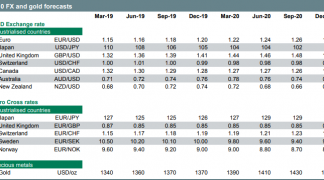 Leuchtmann and the Commerzbank team forecast the Euro-to-Dollar rate will trade around the 1.14 level until at least the end of March 2019, but that it will then rise gradually to 1.22 before the end of that year. "It is fair to say that EUR and EUR/USD won’t deliver much fireworks next year (particularly when compared to the 2017 price action) as the window for the independent EUR rally is closing and the ECB will just about bring the depo rate to zero (but not above)," says Chris Turner, head of strategy at ING Group.